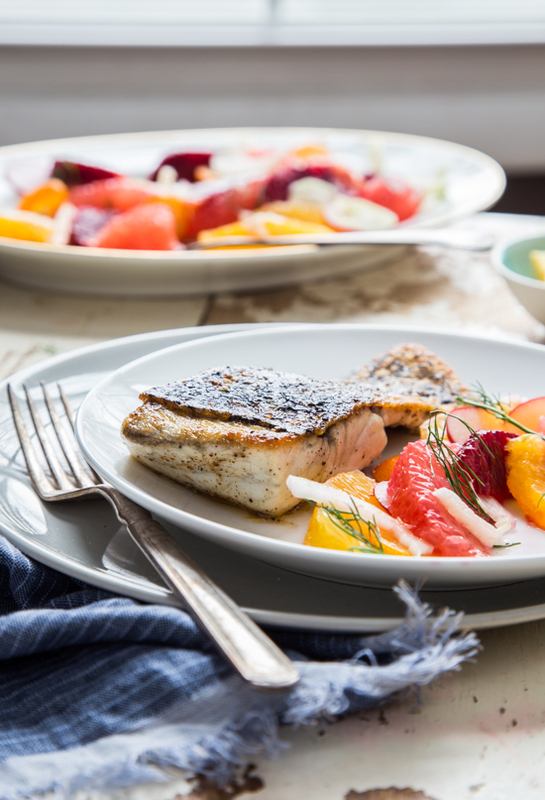 Crispy Skinned Barramundi with Citrus Fennel Salad is a quick, light and fresh dinner that’s perfect for any night of the week! Amidst this seemingly endless winter, I have found myself craving the bright, sunny flavors of citrus. I love how citrus fruits act like little beacons of sunshine during the cold, colorless months of winter. The color spectrum alone leaves me weak in the knees. I’ve been using it in desserts as well as savory dishes, and when it comes to citrus pairings, seafood is an absolute no-brainer. 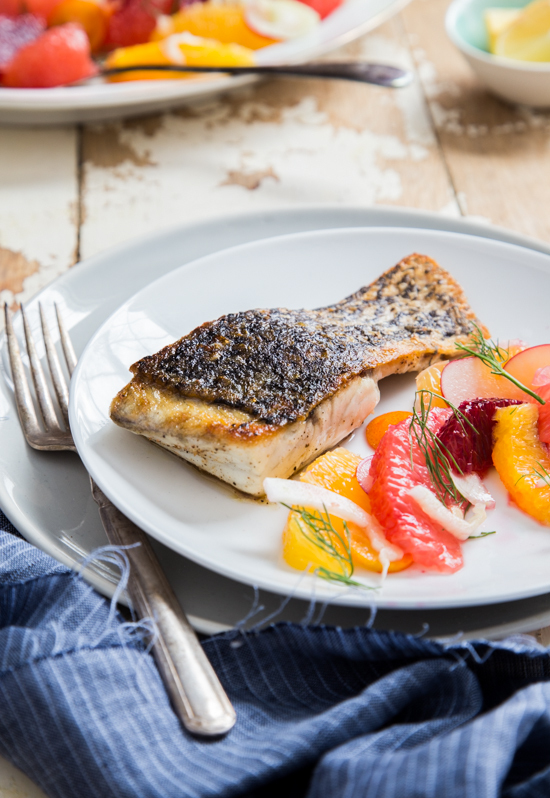 This recipe is a perfect combination of light, crispy skinned barramundi with a bright, light citrus and fennel salad. It’s fantastically refreshing and satisfying all at the same time. Last month, I introduced you to my new found fish love, barramundi. It’s a fantastic sustainable seafood option, often being called “The Sustainable Sea Bass”. Barramundi is high in Omega-3 which is a great health benefit that I can feel good about feeding my family. I found my frozen Barramundi fillets at my favorite place – Trader Joe’s. 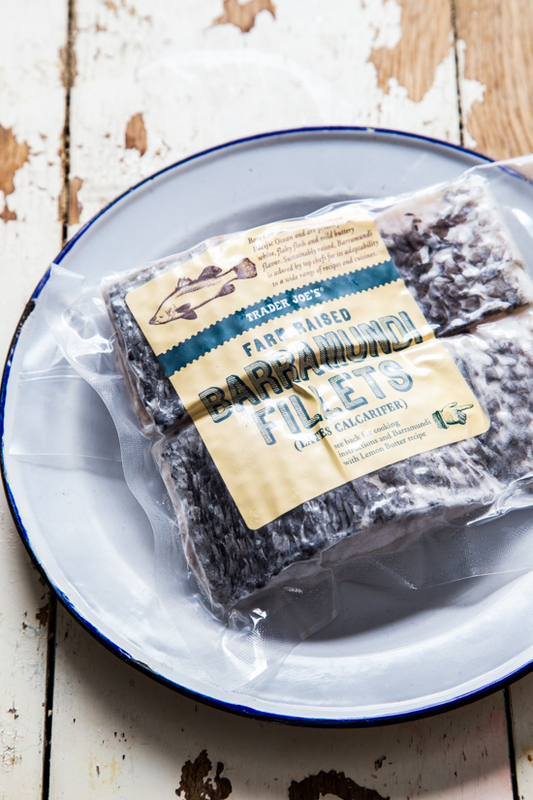 If you don’t have a Trader Joe’s near you, Barramundi can also be found at Whole Foods, Safeway and more. Whichever store you find it in, just give it a try. You’ll love it! In addition to the health and environmental benefits, my favorite quality of barramundi is it’s unbelievable versatility. It can replace just about any fish in your favorite seafood recipes and with these skin-on fillets from Trader Joe’s, it’s perfect for pan searing in order to get a deliciously crispy skin. And that is exactly what I did for this recipe. I could have eaten an entire bowl of this crispy skin. Man, it’s good. Creating a crispy skin on the barramundi was actually really easy to do. I used my trusty cast iron skillet (obviously), but a stainless steel skillet would work just as well. Pat the skin of the barramundi dry with a paper towel, be sure to have your pan screaming hot and then add your oil. When the oil is just starting to smoke, add the barramundi skin side down and then gently press down with a thin spatula. When the fish is about 3/4 of the way cooked through and the edges are turning golden, flip it over. The second side only needs a minute or two. That’s about it! It’s quick and easy and when you pair it with a bright and refreshing citrus salad, you can’t go wrong. 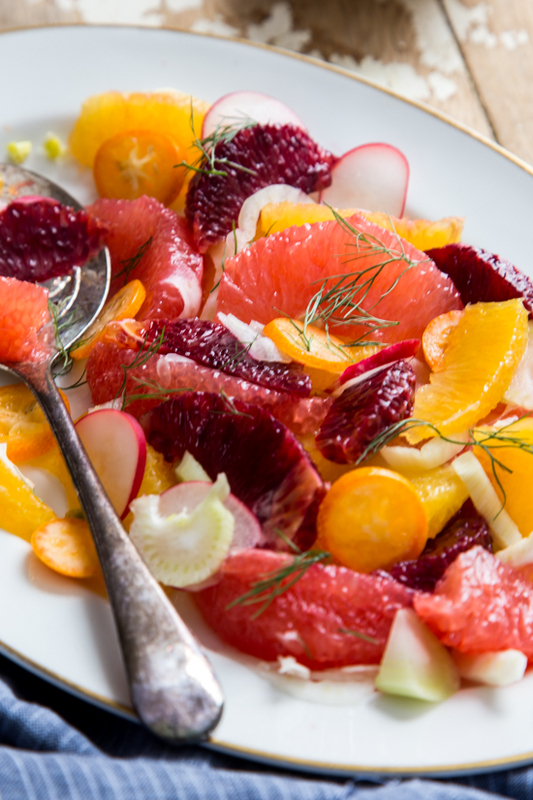 The salad is full of grapefruit, navel oranges, blood oranges and even some radish and fennel for crunch and freshness. For the salad, I supremed all of the citrus, which is just a fancy way of saying I cut all the peel and membrane off. To show you just how easy it is, I made a quick video demonstrating the technique. Seriously, it’s so simple but makes such a difference in the way your salad looks and tastes. 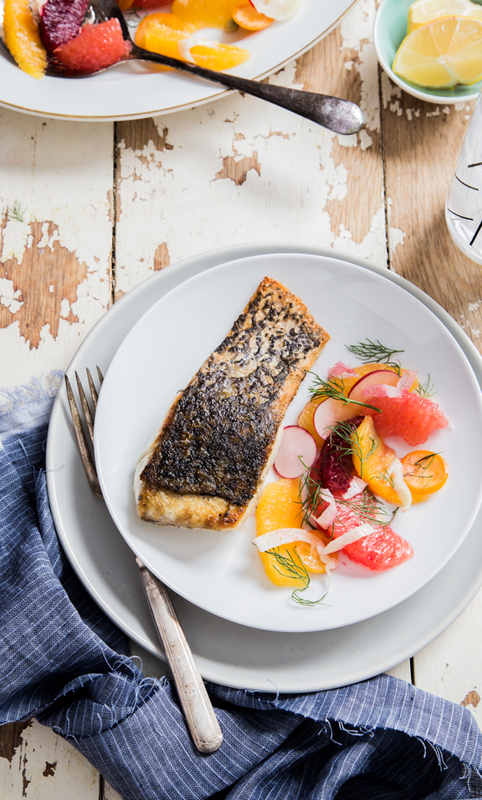 I love, love this crispy skinned barramundi and I can’t wait to try it out alongside different salads and side dishes. Maybe risotto or a kale salad…. But for now, the pairing with this citrus and fennel salad is on the top of my list. Cut all of the citrus fruit into segments removing all peel, pith and membrane. Place segments in a large bowl and squeeze membranes over segments to reserve all the juices. 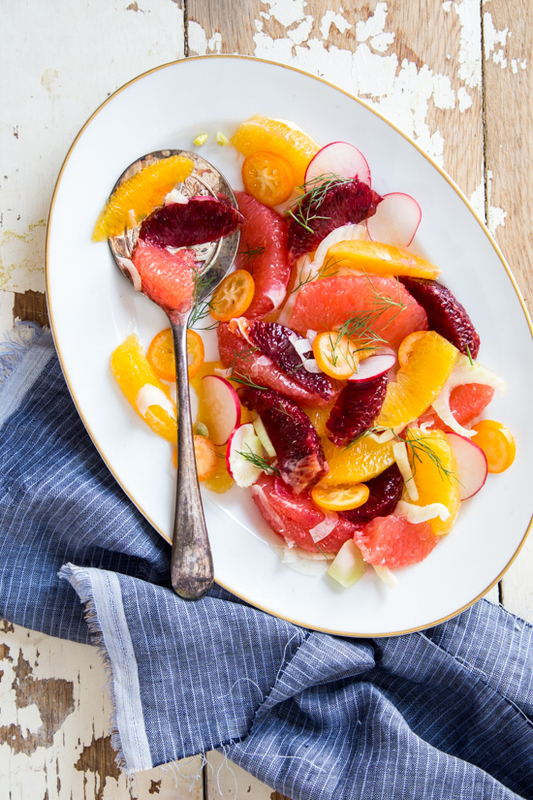 Toss citrus with radishes and fennel. Drizzle salad with 1 teaspoon olive oil and season with salt and pepper. Garnish with fennel fronds and set aside. Pat the skin of the barramundi fillets completely dry with a paper towel and season both sides of the fillets with salt and pepper. Heat a cast iron or stainless steel skillet over medium high heat. When pan is very hot, add enough oil to coat the bottom of the pan. When oil is just at the smoking point, add the barramundi, skin side down. The fish will curl up a bit, so press down firmly with a spatula to ensure that the skin remains in contact with the hot pan. Cook fillets until 3/4 of the way cooked through and the edges are golden brown. Flip the fillets and finish cooking, about 1-2 minutes more. Remove from pan and serve immediately along side the citrus fennel salad. This is stunning Emily! That salad is so colorful and bet it’s the perfect accompaniment to the fish. This sounds & looks simply amazing, Emily! I love all the bright colors….beautiful photos! Beautiful looking dish, great tips on how to get crispy skin.